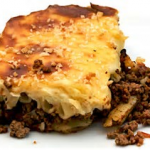 This Pastitso recipe, I think, can be found in any Greek's kitchen...It's the national dish of Greece. You talk about comfort food, Pastitso is at the top of the list. A secret in this dish is the Kasseri Greek cheese....you can't substitute for it but it's not hard to find. Then the bechamel sauce tops the whole dish....it's fantastic. In 4 tablespoons of butter, saute the ground round with the onions, garlic, parsley (crumbling the meat with a fork) until golden brown. Add cinnamon, nutmeg, salt, pepper, wine and tomato sauce; simmer for 30 minutes and remove from heat. Meanwhile, boil the macaroni in salted water according to the directions on the package; when cooked, rinse and drain the macaroni; place it in a bowl and add 1/4 pound melted butter, beaten eggs and a generous sprinkling of grated cheese; mix well. Spread half of the macaroni mixture on the bottom of a greased 9x13x2-inch baking pan; cover evenly with the meat sauce; sprinkle with grated cheese; spread remaining macaroni over meat; sprinkle with grated cheese, cover with bechamel sauce (see recipe below), sprinkle lavishly with grated cheese, dot with butter, and sprinkle very delicately with a few pinches of cinnamon over the top. Bake at 350 degrees for 1 hour. Cool and cut into 3-inch squares. For The Bechamel Sauce:Melt butter in a pan, add flour, mix and stir until smooth. Lower heat and gradually add the hot milk, stirring constantly until it thickens. Add cinnamon and season with salt and pepper.